Have you ever dreamed of becoming a model, seeing your face all over stores and getting dolled up for a shoot to be featured on one of the country’s top fashion magazines like Preview? If it’s a resounding YES that I’m hearing from you then read on below! Your dreams just might become a reality! SM Store Beauty Section has teamed up with Preview Magazine to find the next face for SM Beauty! With the help of your favorite fashion bloggers including myself, join the contest and you just might win these awesome prizes! 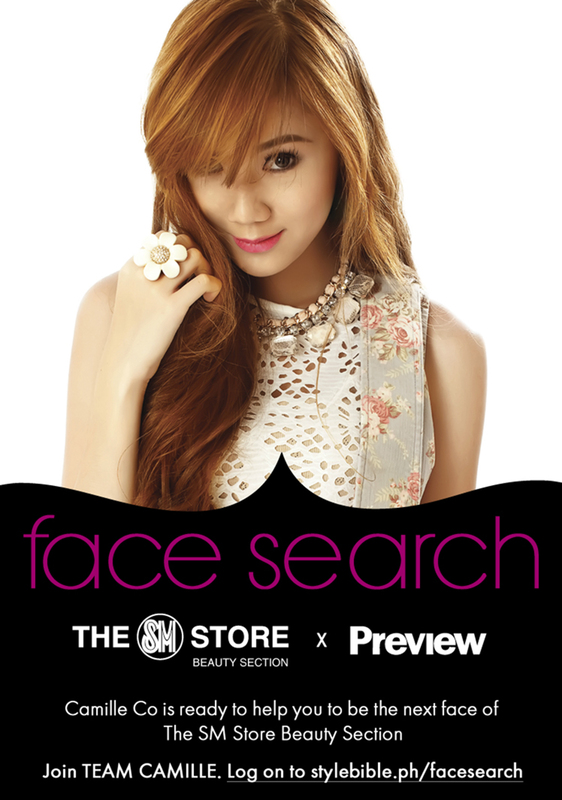 All you have to do is log on to stylebible.ph/facesearch and join TEAM CAMILLE. If you’re chosen to be one of the 3 members of my team, you’ll be getting a beauty makeover day with me! Aside from this, 1 member from Team Camille will win a cover and feature in Preview Magazine’s beauty special for December with all 3 of us fashion bloggers plus P50,000 cash! Now isn’t that exciting???? Join TEAM CAMILLE! I just wanted to ask when is the deadline of posting this pictures? I definitely love to be on your team. hi camille, what does, receipt means? what pic should i upload there? Jam, pwede ka kasi yung anak ng kaibigan kong 17 lang eh nireplyan na raw nila..
went to SM Makati earlier, can’t figure out where the SM beauty products are. Is it with the different brands of cosmetic products? Yay! :) Good luck Karen! Unang tingin ko sa buhok mo nagustuhan ko na agad. Anong color?